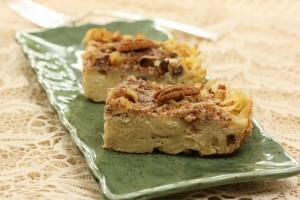 Noodle kugel is often made with things like butter, sour cream, cream cheese, and sugar. It’s a Yom Kippur break-the-fast favorite, but can fill up empty stomachs in seconds flat without much in the way of nutrition. We slim it down and even use whole-wheat noodles to enhance the good nutrition. And your kids will never know the noodles are whole wheat because they blend right in! SPECIAL OFFER: SchoolFamily.com readers can purchase No Whine With Dinner at 30 percent off the list price, and get free shipping, by ordering the book here and using this promo code: FS2011. Coat a 13 x 9-inch baking dish with nonstick cooking spray and set aside. Bring a large saucepan of salted water to a boil. Add the noodles and cook until just tender but still have some bite. Drain and set aside. In a large bowl, whisk together the eggs, cottage cheese, sour cream, milk, currants, and sugar. Stir in the pasta until coated with the egg mixture. Transfer the mixture to the baking dish. Combine the pecans, sugar, flaxseed, and cinnamon in a bowl and sprinkle evenly over the kugel. Cover loosely with aluminum foil and bake 30 minutes. Remove foil and bake until the topping gets crispy and brown and the kugel is set, an additional 30 minutes.